CES 2018: Lenovo Mirage Solo with Daydream announced as world's first standalone Daydream VR headset. Today at CES 2018, Lenovo launched the world's first standalone Daydream VR headset - Mirage Solo with Daydream. It combines the simplicity of an all-in-one headset - no more being tethered to wires, PCs or phones - with the immersive experience of motion-tracking technology on Daydream's virtual reality platform. 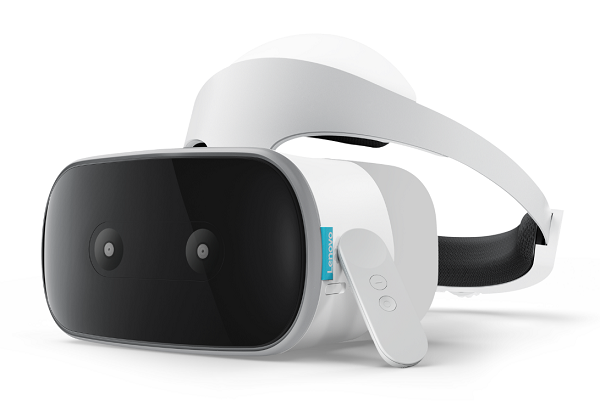 Lenovo Mirage Solo users will be the first to experience the full potential of motion-tracking technology, called WorldSense, on Google's Daydream virtual reality platform. WorldSense lets you move around and explore your virtual environments as if you're truly there - leaning, dodging or ducking through space. Utilizing the advanced features of the Qualcomm Snapdragon 835 VR platform designed to support built-in VR functionality and help developers to rapidly release compelling content, and 4GB of RAM, Lenovo Mirage Solo can easily handle the most demanding Daydream virtual reality experiences. Lenovo also built the headset's display for immersive VR engagement with an incredible 110-degree field of view-so you can see more of what's around you. Until now, portable headsets have been limited to tracking head movement using cords and external sensors. In reality, you can experience content by turning your head left to right at court-side in a live basketball game, glancing skyward at snow-capped mountains or looking behind you in 360-degree spherical videos. But now with WorldSense's inside-out positional tracking technology, the headset can mirror real life by tracking its position in space through built-in tracking cameras and sensors. With up to seven hours on a single charge, Lenovo built the Mirage Solo headset to handle extended periods of continuous use. The headset is designed to fit nearly any size wearer, with quick-release buttons for visor adjustments, adjustable dials and size accommodations for nearly every face shape, visual aid and head proportion. The Lenovo Mirage Solo also comes with a wireless Daydream controller, which acts as a unique and intuitive extension of your hand. Sporting a clickable trackpad, app and home buttons, and a volume rocker, you can change the controller's function from app to app. Besides a navigation controller, it can also serve as a baseball bat, steering wheel or whatever fits that app's purpose. The Lenovo Mirage Solo is expected to be available starting in the second quarter this year.